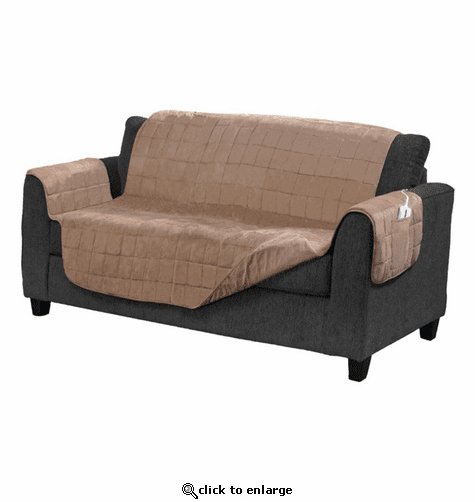 The Serta Electric Warming Loveseat Protector will take comfort and luxury to a whole new level. The Electric Warming Loveseat Protector can provide a level of soothing therapeutic warmth unmatched by any other product on the market. We've constructed this amazing oversized warming protector with a luxurious 100-percent Polyester Microsuede face that is exceptionally durable, easy to care for, and able to withstand years of continuous use. A decorative quilted pattern adds a touch of elegance while providing added strength. Polyester fiberfill center adds an additional layer of loft. Non-skid dot backing helps the warming protector stay in place and eliminates shifting and bunching. The easy-to-use controller has four different settings right at your fingertips to adjust the level of desired heat. An LED light shows the level of heat being produced. The warming controller can easily disconnect from the warming protector for storage and cleaning. We've sewn in a pocket on the arm to hold the warming controller so it is always convenient to use. This warming furniture protector can be conveniently machine washed in warm water.